Free or all students ages 8 – 14 No cost to attend. Imagine planting a million trees, what you would feel like, how you would change the world… Now get started! 80 lucky students ages 8 – 14 from area schools will train to serve our community as Climate Justice Ambassadors! Worldwide, over 19,000 young students have been through this fun and educational Academy training, and joined forces as leaders of the Official Tree-Planting Campaign of the United Nations. Play experiential games to understand how our world needs to change, learn to plant a tree with Seattle Parks naturalists, get a photo with local leaders, rehearse the slideshow and end the day giving the slideshow to invited guests. Students, age 8 – 14, who care about our future and who want to plant a truly tree-mendous transformation of our planet, please attend this one-day workshop on May 24th to send a powerful signal against the climate crisis. At 4pm that day, families and invited guests will come see the slideshow presentation given by the students at the conclusion of the training. Plan to attend with the whole family to experience this powerful work and celebrate the world’s newest Climate Justice Ambassadors! Then join us in Seattle Parks the following Saturday November 2nd, Green Seattle Day! Bring the whole family out to launch Seattle’s Tree-planting Season. Thanks to support from the Seattle Parks Dept, and Coolmom for all the help making this a fantastic free event, open to all students! To learn more, go to the “Seattle Plant for the Planet Academy” page. Questions? Contact Michael Foster. 15 year old Esha Marhawa from West London wrote a petition to keep climate change in the national curriculum for children in England. She’s outraged that the newly proposed curriculum vastly scales back on teaching climate change. Her petition on the website change.org gets more signatures every hour. You can Sign the petition even if you don’t live in London or go to Hogwarts. What are our standards for teaching climate change science in the U.S.A., anyway? In December, I offered my climate change slideshow to a 7th grade Science class. They were just wrapping up their unit on Climate, so the timing was Perfect. I started by asking students a rhetorical question, “Who here knows about climate change?” 3 hands went up out of 27 students.”Do you know about greenhouse gasses?” 2 hands went up. The teacher smiled politely. And that’s when it hit me. It turns out “Climate” in our public schools is tornadoes, weather systems, earthquakes, and you know… “Climate.” “Change” is something else. I looked back at the students, my jaw on the floor. He was terrified and angry. And he was right to be. I assured him, “I’m getting to that now.” He sat down again quietly and the class listened for 45 minutes barely breathing. The end of the talk is an inspiring call to action using examples of youth leaders who are changing the world. I asked the 7th graders to write down their immediate reaction to the new coal export terminal proposed for Cherry Point, WA. I took their written comments to the public hearing in Downtown Seattle that very night. I shared their dismay, their horror, their sense of what is right and good in the public record. These 12-year-old kids who learned of global warming that day added their voices to the growing chorus demanding an end to the madness destroying their planet. 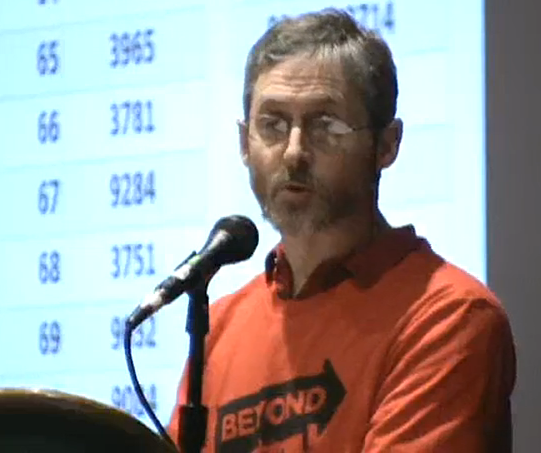 2,500 Washingtonians had crowded into the Convention Center to oppose the coal export terminal. The wildest, loudest cheers of the night ( in fact the only cheers permitted in the hall) shook the rafters as children spoke up courageously, with absolute moral authority, to teach us grownups what is right and good, and what is madness. You can watch the video online. Kinda makes you want to start a petition doesn’t it? 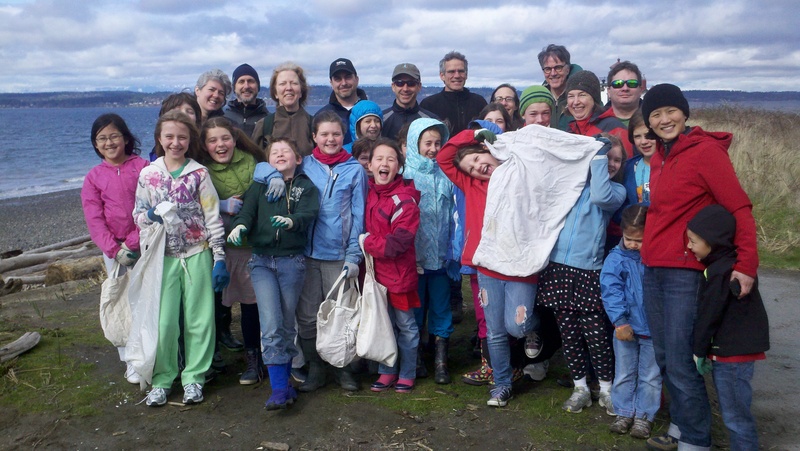 Care for the Planet, the Lincoln Elementary club working to reverse global warming, cleaned debris from Discovery Park beach on our day off from school. A bald eagle watched over us while we worked, and did a long slow graceful fly-by at eye level when we circled up to say thanks and goodbye. What a day!